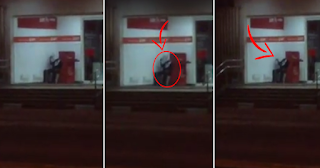 Viral: Headless Security Guard Caught on Tape! CREEPY! One student from Central Luzon State University named Ivan Mendoza and with his cousins witnessed a creepy scene on their way home. According to him, they noticed an alive security guard from a bank that has no head. Ivan said that when he first saw this security guard, he thought that his sight was just a bit blurry, when he told his cousins, they also couldn’t believe what’s happening at that time. He tried to film it so they could zoom in to make sure that this security guard has no head. When they realized that everything is real, they refused to think other things and just immediately left the area. Ivan Mendoza uploaded the video yesterday and its now giving rounds the social media, Watch how creepy that experience is. that's kind of weird..but it's obviously fake.his head was in behind.duhh! !make sense sometimes to make your videos viral.by the way it is nice knowing yahh video..it seems like fake..